This web page is a "catch-all" for material supporting aspects of PAWM that don't have sufficient "general interest" to appear on the PAWM home page. The following two figures are repeated from the PAWM home page. 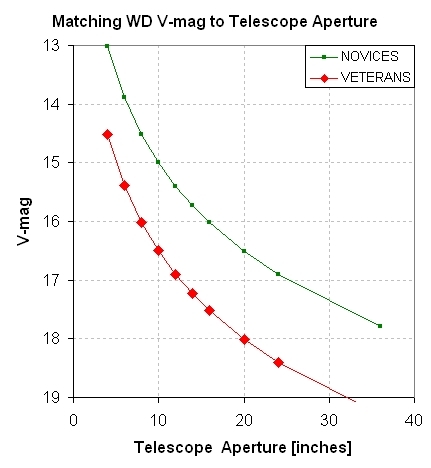 Figure 1 Left: Preliminary result showing the faintest V-mag's for which useful LCs can be obtained versus telescope aperture. 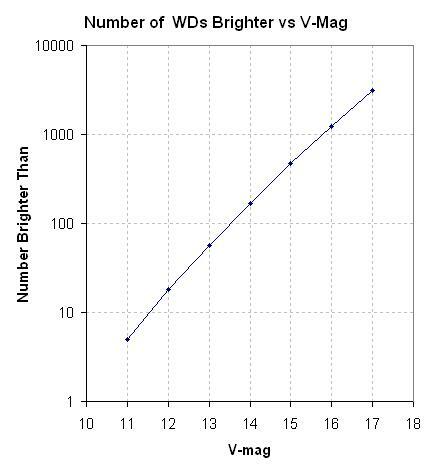 Figure 1 Right: The number of known WDs brighter than V-mag values. The left panel, above, will be revised as PAWM observations enter the archive. So far this is a conservative interpretation of the first two submissions. Combining information in the two panels leads to the conclusion that a 14-inch telescope is capable of characterizing more than ~2500 WDs, provided experienced users are involved. where D is telescope aperture [inches], W is the PSF's FWHM ["arc] and g is CCD exposure time ("gate time" for engineers) [minutes]. The constant 14.87 is determined empirically for use of a SBIG ST-8XE CCD camera and an unfiltered passband. Limiting magnitude, ML, is defined here as a magnitude for which an "optimized photometry aperture radius" produces SNR = 3. 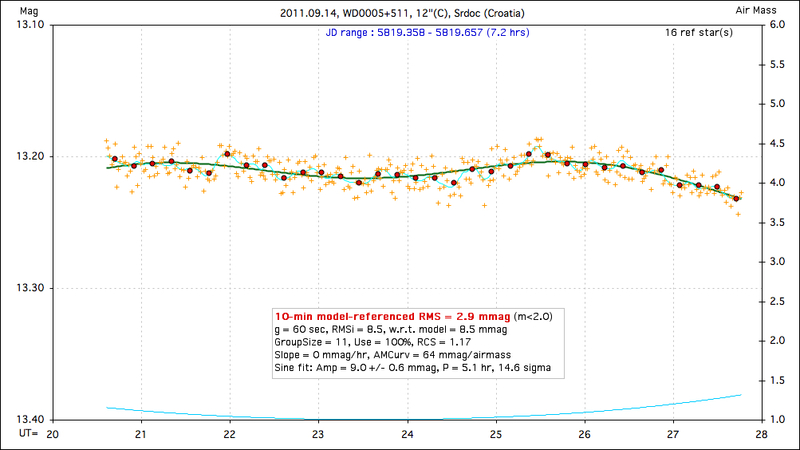 The term "optimized photometry radius" needs explanation. When constructing a light curve (LC) from an image set where "atmospheric seeing" is approximately constant there is a photometry aperture radius that produces a minimum in the LC's RMS. The best photometry aperture radius is ~ 2.5 x FWHM for bright stars; considering ever fainter stars this optimum radius decreases to ~ 1.0 x FWHM, which is a common choice for asteroids. This range of values, 2.5 to 1.0, is based on "real world" measurement experience; a theoretical treatment that neglects such real world issues as variable seeing predicts a best radius of 0.75 x FWHM for stars of all brightnesses (when only 65% of the star's flux is captured). The above equation is for bright stars. Since WDs range from "bright" to "faint" the constant in the above equation should vary with WD magnitude. One of the goals for PAWM is to establish, from WD LCs submitted by many amateur observers (with different "atmospheric seeing"), an empirical relationship for the curve in the left panel, above. The final curve is likely to have a slightly different "slope" because of the dependence of best photometry size on star brightness. Exposure times should be 30 to 60 seconds, with 30 seconds preferred for the bright WDs. With an image download time of ~ 10 seconds the duty cycle for observing should be acceptable for these exposure times. I recommend observing either unfiltered, or with a "clear with blue-blocking" filter (which I refer to as a Cbb), or an Rc or r'-band filter. Since we won't be observing close to the horizon there's no need to employ a Ic or i' or z' filters. There is one situation where these long wavelength filters may be useful, and that's when the moon is close to a target. Full moon in September occurs on September 12/13 (when moon's DE =0). When observers work the same target in coordination it is not necessary that all use the same filter since we're just looking for a big transit feature. Flat field calibration and autoguiding are perhaps less important when searching for transit depths of hundreds of mmag, but why not adhere to the good practices that have served us well for observing known exoplanet stars. The brighter WDs (V-mag < 14) will have finder images at the Villanova White Dwarf Catalog (link). The fainter ones, however, will usually only be identifiable in your images by performing a PinPoint plate solve on a sharp image and then searching for a star at the WD's coordinates. I might add a finder image with the WD identified in a column of the WDtargets web page (link) for these faint WDs. Since we're searching for a very brief fade of large amount it is important to disable any outlier rejection procedures that were created for analyzing main sequence star exoplanet transits. Any submitted LC or data file should include ALL data that is accepted based on image properties (e.g., images with poor autoguiding should be rejected from analysis prior to producing a light curve). Selecting reference stars should be done carefully, which is something I've preached for the past 3 years. During my exoplanet observing I've encountered two flare stars and several delta Scuti stars among my reference candidates, and if a single flare star star is used for reference it would make the target star look like it underwent a brief and deep transit; similarly, if a delta Scuti is used for reference the target star would appear to undergo delta Scuti variations. I normally include up to 28 stars plus the target star in my photometry measurements when creating CSV-files for import to a spreadsheet where an optimum subset of the 28 candidates are used for reference (total star flux, etc). I visually inspect a LC plot that includes all of the candidate stars inorder to identify "misbehavior." This is described in my exoplanet book (Chapter 18). For faint targets the best photometry apertures are smaller than for V-mag 10 -13 stars. For example, I've found that for a 14-inch telescope the optimum photometry radius is ~ 2.5 x FWHM for V-mag ~ 10 - 13, 1.5 x FWHM for V-mag ~ 14, and 1.2 x FWHM for fainter targets. Please keep copies of your image sets in case re-processing them is needed. You may attach (or embed) a light curve plot to an e-mail, or attach a data file with a format the same as given at this link. I will maintain links to a web page devoted to each WD that is observed. 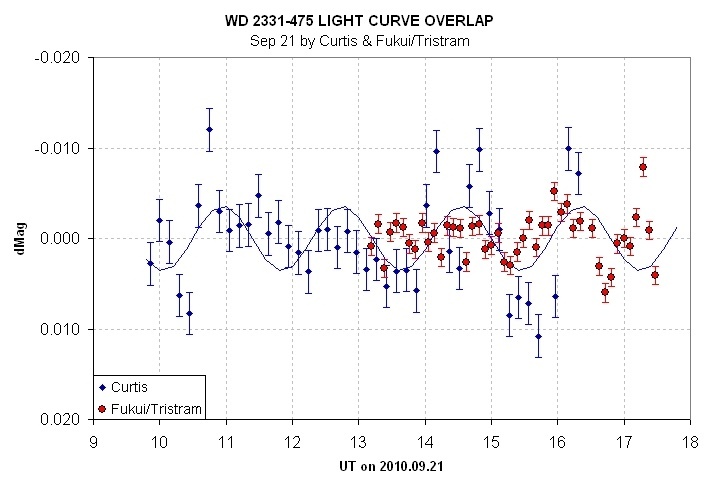 The data files have a link below the light curve (for those whowant to perform additional analyses). The web page "List of hot and cold WD targets" (link) will show how many hours of LC observations have been accumulated for each target, and it will include a link to a web page devoted to each observed target. 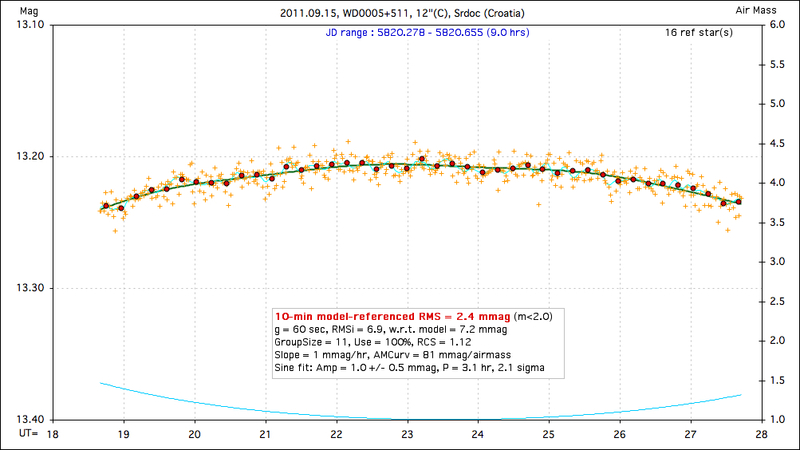 If you submit a light curve plot (jpg preferred) I suggest that you use a standard magnitude range of 1.0 magnitude and a standard time interval of 8 hours (unless more are needed). If we all use the x- and y-axes scale it will be easier to compare LC features from different observers. Figure 2. TheSky/Six display for the HAO observing site at local midnight in late July. Yellow magnitudes show white dwarf locations and their V-mag value (for V-mag between 15 and 16). By toggling the state of a menu box the B-V colors for these WDs can be displayed. The same capability is available for WDs with V-mag < 14, or between 14 and 15. I'll use displays such as this for producing WD candidates needing observations. If anyone wants a copy of the sdb-files you may e-mail me your request and I'll ask Howard if he's willing to share them (since his original catalog is proprietory at this time). Before a target has been observed it has zero "completeness coerage" for all periods of interest, P = 4 to 32 hours. After an 8-hour session its completeness coverage is 100% for P <= 8 hrs, and lower values for longer P. For example, completeness coverage for P = 32 hrs is 25%. For 16 hrs it is 50%, etc. 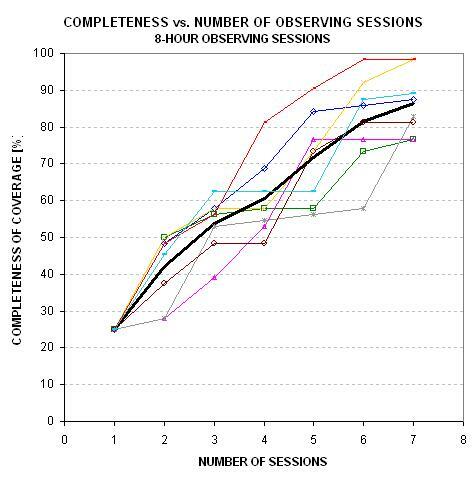 If another 8-hour observing session is made at a random time the completeness coverage versus P cannot be calculated until the relationship between the two 8-hour observing sessions is specified. A simulation using random start times for 8-hour sessions is presented in the next section (Fig. 4.). It is constructed by specifying a set of start times, fixing the end times to 8 hours later, choosing an arbitrary reference time (such as the beginning of the first observation), and for each P value (from 4 to 32 hours) calculating whether or not any of the observing sessions was ngoing during each of 20 phase values (e.g., phase = 0.025, 0.075, 0.125, etc). Phase is defined zero at the reference time, and it varies linearly to 1.00 one period later. Every observing time during an observing session can be assigned a phase value by subtracting integer periods, as necessary, to arrive at a fractional period, and this fractional part is the phase. Here's an example of a "completeness coverage" plot. Figure 3. 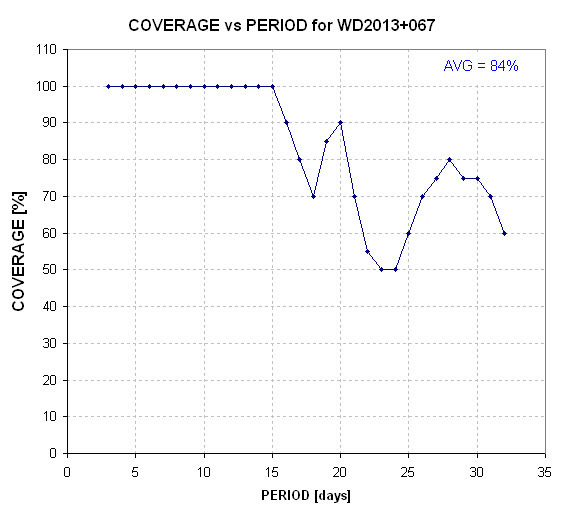 Percentage coverage versus period for star WD2013+067. Notice that the completeness coverage trace is not monotonic. This is because the phase range for one observing session can mostly overly the phase range for another observing session, for a specific period, while having less overlap for other periods. For this plot the average coverage is 84%. I think PAWM will adopt 75% as a criterion for re-categorizing a target WD from the "hot" list to the "cold" list. 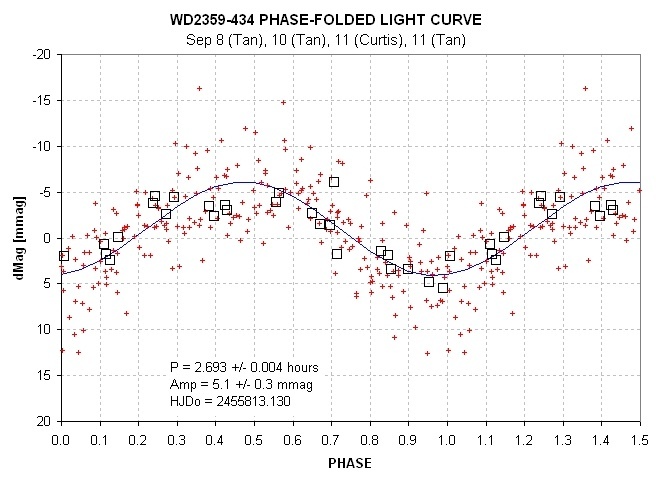 The most desireable observing strategy for WDs with periods as long as 32 hours is to obtain a set of light curves that achieve complete coverage for any 32-hour observing interval. A spacecraft could do this, but mid-latitude ground stations are limited to ~ 11 hours per observing session during winter. In September (autumnal equinox) observing sessions are limited to about 10 hours. Consider the case of even shorter observing sessions, 8 hours, made at randoom times. How many of these sessions are needed to achieve ~80% coverage of a 32-hour exoplanet period. Figure 4. Completeness of coverage of 32-hour period exoplanet using only 8-hour observing sessions and a Monte Carlo simulation, assuming that observing sessions are made at random times. This Monte Carlo simulation shows that on average 80% coverage is achieved after six 8-hour observing sessions. Comment       : 5 ref stars. Clr, no moon, seeing normal. Note:  the data lines have a 3rd column, which in this case is the observer's estimate of RMS. Any data following the first two columns is ignored in my processing. When an observer sends me a raw data file, I import it to an Excel spreadsheet where it eventually produces a light curve (LC). The LC  is fitted by a simple model that allows for  a temporal   trend  and air mass curvature. The temporal trend may be caused  by an imperfect  flat field and  imperfect autoguiding. The air mass curvature  is almost  always   caused by the target star having a different color from  the average  of the   reference stars (or the single comp star if just one  reference is  used). The model also permits fitting a transit with several  free parameters,  but  for PAWM this feature may never be needed. A screen  capture of the LC  is placed on the PAWM web page devoted to the target star. Below each LC graph I (usually) include links to two data files. The first one is the raw data file sent to me by the observer. The second one consists of four processed magnitude types, plus RMS. Here's an example of this data file, with "spo" replacing "raw" in the orignal filename. Figure 6. Example of a "spo" data file. The JD format has been shortened. The 3 mag columns are explained in the text. The last column is RMS. The "spo" header comment lines have been slightly modified from the raw data file header. The JD is in what I call JD4 format. The first magnitude (2nd column) does not have "systematic effects" removed. Hence, when plotted, it may have a temporal trend and air mass curvature pattern. These are the magnitudes I use in plotting the light curves on this PAWM web site. The second magnitude (3rd column) has systematics removed. I can produce light curve plots of this data, but none are presented at the PAWM web site. The third magnitude (4th column) is the same as the previous magnitude except that an everage has been subtracted. These magniutdes are ideal for plotting when searchig for similar structure in different LCs, or when performig phase-folding analyses. The last column is RMS for the JD4 region. It may be useful to compare one's RMS performance with others after compensating for the observer's telescope aperture and star brightness. I have done this by standardizing the measured RMS10 to what could be expected if the same observer had used a 14-inch aperture telescope while observing a star with V-mag = 14.0. This conversion is "tricky" because, for example, the level of scintillation changes, yet scintillation typically contriutes only ~ 1/2 of the total to RMS10. Figure 7. 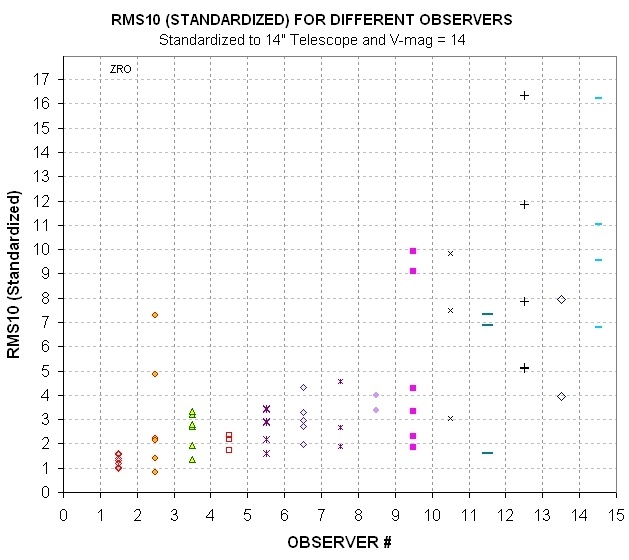 RMS10 standardized to a 14-inch telescope and V-mag = 14.0, for various observers. The best observers by this measure is Roberto Zambelli (Italy), who uses a 10-inch telescope and a G-band 495 nm long-pass Baader filter. The above equation assumes that there's a "floor" for Earth surface-based observations of ~ 0.5 mmag that simply can't be overcome by increased aperture or star brightness (possibly related to decorrelated movement of star location with respect to each other). The last term assumes scintillation typically accounts for half of the total RMS10 budget (which I find to be the case for my 14-inch observations). According to this measure the best PAWM observer is Roberto Zambelli, who uses a 10-inch telescope and a 495 nm long pass (Baader) filter. If he were using a 14-inch telescope while observing a 14.0 magnitude star he could be expected to produce LCs with RMS10 ~ 1.4 mmag! That's impressive! Congratulations, Roberto! Honorable mention go to Javier Salas (Spain). Any finite length sequence of data, such as one having a Gaussian distribution, can be fit with a sinusoid function with any periodicity (subject to the normal limits of data spacing and total length). One of these sinusoid fits will be best, using RMS scatter as the measure. It is intuitively obvious that if all data are re-scaled to larger values by a multiplier, the best fitting sinusoid function will have a larger amplitude given by the same re-scaling multiplier. Hence, it should be expected that best-fitting sinusoid amplitude should be linearly related to RMS noisiness of the data sequence. The coefficient relating these two parameters will depend on the function describing the data, such as whether it is purely Gaussian or some version of a random-walk function. It is not obvious what can be expected from a data sequence corresponding to a photometric light curve, so the best way to find out is to perform an analysis using actual data. This web page section describes results of such an analysis using PAWM light curves. 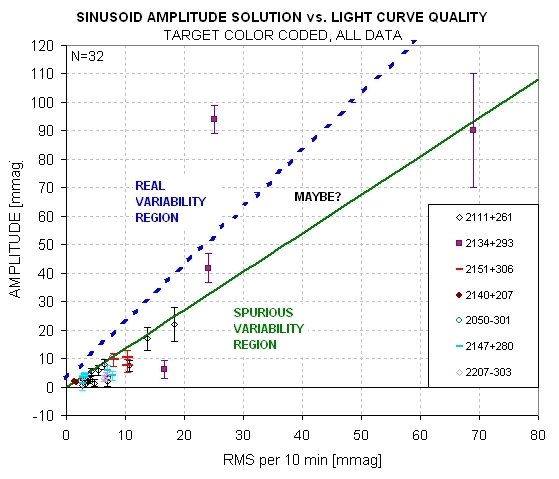 The PAWM archive includes 23 light curves (LCs) for which a sinusoid fitting solution has been performed (as of 2011.08.30). We have used a LC noise parameter called RMS10, which is the SE for 10-minute averages. RMS10 is based on the number of images per 10 minutes of telescope time, and the RMS of individual image magnitude values.The RMS of individual magnitudes is simply the standard deviation of individual magnitude differences from a model fit of that part of LC data for which air mass < 2.0. Why use a 10-minute interval? I adopted the 10-minute interval several years ago when I began observing exoplanet transits and I estimated that the longest averaging interval for a LC that could usually provide an acceptable transit shape was 10 minutes. For PAWM the parameter RMS10 is therefore an arbitrary choice, chosen for convenience because a spreadsheet used for fitting LC data already had this parameter calculated. A sinusoidal fit is achieved using a spreadsheet by first manually producing an "eyeball fit" by adjusting slide bars for amplitude, period and phase. Then Excel's "Solver" tool is invoked for refining the fit. Solver is allowed to adjust amplitude, period, phase as well as offset, temporal trend and air mass curvature. In other words, 6 parameters are allowed adjustment for the sinusoidal fitting process. Solver searches for a solution by minimizing "chi-square" (sum of squares of magnitude differences from a model using the 6 changeable parameters, where differences are normalized by RMSi, and RMSi varies throughout the LC). It should be noted that chi-square may have more than one "local minimum" in the 6-dimensional parameter space describing all possible models. Therefore, the user must consider more than one possible "eyeball fit" period (and amplitude/phase) when searching for what is hoped to be the "global minimum" for chi-square. A log sheet is used to record each LC's RMS10 and best fitting sinusoidal amplitude. Here's an example of the relationship of these two parameters for the PAWM targets that have received the most attention (30 LCs). Figure 8a. 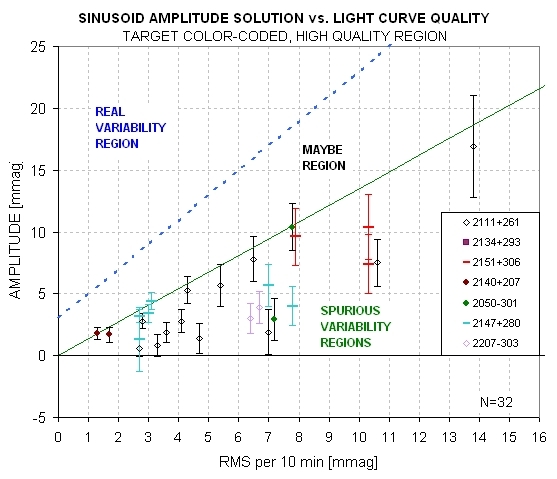 Sinusoidal amplitude versus LC noisiness (RMS10) for all 30 targets that have been fitted for a sinusoid variation. The line is a suggested "upper envelope" having the equation: Amplitude = 1.35 × RMS10. Figure 8b. Same data except showing only the high-quality LCs. These plots shows a trend suggesting that the poorer the LC quality the larger the fitted sinusoidal amplitude. Extrapolating back to a perfect LC (RMS10 = 0) suggests that there would be no sinusoidal variation. A more accurate description is that an envelope exists below which are fund all sinusoid amplitudes (with one exception ou tof 30 cases). This implies that none of the measured amplitudes are "real" - with the possible exception of one LC WD2134+293, discussed below). In other words, essentially all plotted amplitudes are "spurious." Could the envelope slope be the coefficient we're searching for? The envelope slope is 1.35. Stated another way, spurious sinusoid amplitude fits can be as high as 1.35 ×RMS10. The next figure is a target-color-coded plot of all 30 PAWM sinusoid fit solutions. Figure 9a. 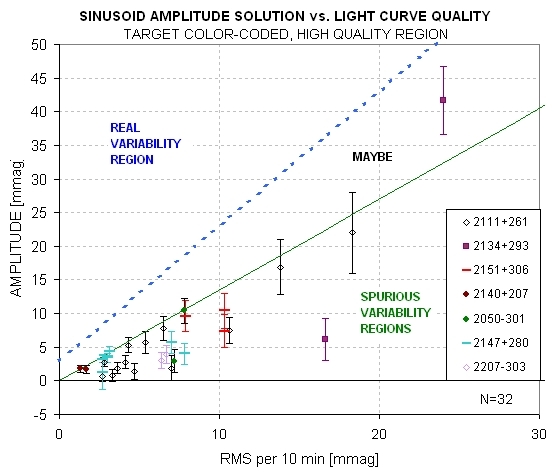 Sinusoidal amplitude versus LC noisiness for all 30 cases in the PAWM archive (up until 2010.09.02), with suggested regions for "spurious" amplitudes, "maybe real" amplitudes and "real" amplitudes. Figure 9b. Same data except showing only the high-quality LCs. Figure 9c. Same data except showing only the high-quality LCs. Let's make a distinction between "high spurious" and "low spurious" in order to identify LCs that have very small systematic effects (and low spurious amplitudes) as opposed to those with high systematics (and high amplitudes). In the next figure the border region between "spurious" and "maybe" is assigned its own region. Figure 9d. Four regions ame data except showing only the high-quality LCs. These four regions will be used in categorizing LC variability (starting 2011.09.04). 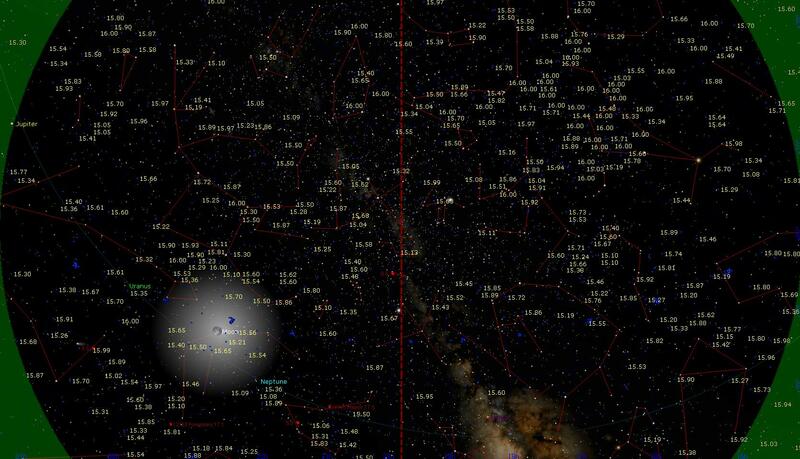 So far, 30 of the 32 stars that have been subjected to sinusoid fitting are located in "spurious" regions 1 and 2. In the "What's New" web page, where I give one-liners for each LC that's been processed, I will include a region number and include RMS10 and amplitude information in the following way: variability "spurious high" (xy = 2.6/3.4). The xy entry gives the x and y coordinates in the above figure, which is to say that x = RMS10 and y = amplitude. Thus, in this example, RMS10 = 2.6 mmag and amplitude = 3.5 mmag. Fig. 7a shows an LC in the "real" region, WD2134+293 (2011.08.17 by Srdoc), which was the subject of targeted follow-up observations because of it's apparent non-sinusoidal, 0.18 magnitude variation. As more PAWM targets are observed this criterion equation will probably be modified. To check up on what sort of noise might cause the correlations you are seeing, I created a series of 6 hr. damped random walk light curves with a range of noise levels. A damped random walks is a random walk that returns to the mean over some specified timescale (Zeljko Ivezic likes to call this a 'married drunk'); see http://en.wikipedia.org/wiki/Ornstein–Uhlenbeck_process also called a continuous time ﬁrst-order autoregressive process, or CAR(1). I set the damping to a time scale of 10 minutes, equivalent to where you are measuring the RMS, and I set the exposure times equal to 1 minute. For each light curve I computed the RMS over 10 minute time bins, and I then fit each light curve with a combination of a sinusoid and a quadratic with time, optimizing the sinusoid starting within a period range from 30 min to 6 hr. Each light curve is a completely random realization with the property that the noise is correlated on timescales on the order of 10 minutes, but becomes less correlated on longer timescales. 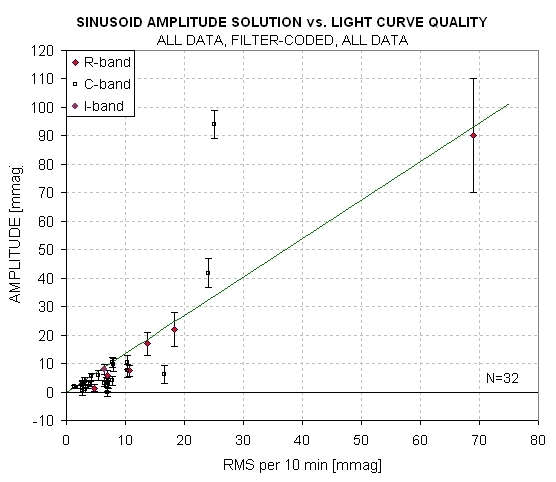 The attached plot is the result of this experiment which shows a strong linear correlation of the amplitude of the sine curve with the RMS over 10 minutes, similar to the results you are finding for observer's light curves. The median best-fit period is 100 minutes, with standard deviation 73 minutes, with a range from 30 to 440 min (this is longer than the 6 hr I stated above since I carry out an Levenberg-Marquardt optimization for the best fit period found initially in the range of 0.5-6 hr). Anyways, this exercise maybe shows the plausibility of the correlation being caused by random correlated noise in the light curves. I'm not sure what is special about 10 minutes. Figure 10. Eric Agol's simulation showing sinusoid amplitude of fits to a random walk sequence of data. I agree that this simulation could be a good way to represent actual light curves. There are two aspects of this simulation that deserve comment: random walk and auto-regression (or "married drunk"). A random walk property can be produced by several real-world issues. One is the use of an imperfect flat field (no flat field can be perfect, as described in many places) as the star field moves across the pixel field during the observing session. Even good autoguiding can't keep all stars that are in the FOV fixed to the pixel field. Image rotation due to an imperfect polar alignment (or non-orthogonality of axes) is one reason. Star locations wander in a way that is uncorrelated with each other on times scales of seconds when they are a few 'arc apart, so their average location relative to each other isn't exactly the same for each exposed image. Image scale can vary slightly as the telescope tube shrinks from cooling during an observing session. The wavelength passband changes with air mass differently for stars having different colors. These are a few ways that systematic effects related to flat fields can insinuate themselves into a long observing session with timescales of minutes to hours. Another category that can simulate random walk effects is produced by varying "atmospheric seeing." As the seeing changes each star's PSF will vary. When a star is close to the edge of a photometry aperture sky background annulus it can cause variable fading of the flux of the star being measured (in the signal aperture circle) because of the nearby star's PSF spilling into the background annulus. Seeing will vary on all timescales. All of these systematic effects become "auto-regressive" in the final light curve because my fitting procedure uses "temporal trend" and "air mass curvature" as free parameters. This guarantees that a fitted LC will minimize the longest timescale components of any of the random-walk systematic effects. I like the term "random walk with an elastic leash" becuse it captures the essence of everything I've just described. It should be mentioned that the coefficient relating "spurious sinusoidal amplitude" and "RMS10" should vary with season, and be slightly different for each observatory. For example, every observatory will have different atmospheric seeing behaviors, which will vary with season differently from other observatories. Some telescope tubes don't shrink as they cool, so image scale changes won't be a problem for them. Etc. Therefore, I am not surprised that Prof. Eric Agol's simulation captures the essence of the real-world relationship that I have labeled "Region 2" in Fig. 7d. Poisson and thermal noise are straightforward to calculate, and they can even be calculated as a function of time during a light curve. Scintillation varies on hourly and daily timescales; however, changes during an observing session are due mainly to changing air mass. Scintillation has a typical dependence upon air mass, telescope aperture, exposure time and site altitude, so an estimate can be made of expected scintillation versus time during an observing session. Actual scintillation can differ from estimated (typical) scintillation by a factor of 2 or 3 at any given time. Systematics can't be estimated in any straight-forward manner. Since total noisiness versus time during an observing session can be determined it is possible to compare this with the two components of noisiness that can be determined (Poisson and thermal) to infer the value of the two components that can't be determined (scintillation and systematics). Or, since scintillation can be estimated, it is possible to infer the level of systematics noise by orthogonally subtracting the orthogonal sum of Poisson, thermal and scintillation from measured total noise. 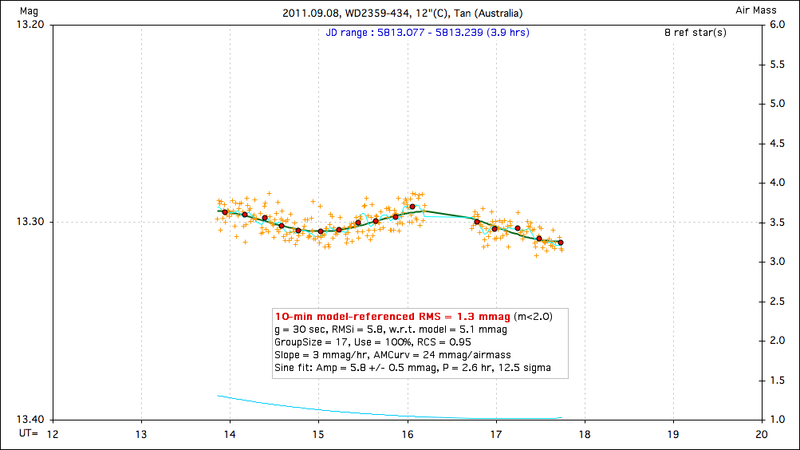 RMS10 is measured noise based on that part of the light curve with air mass < 2 (an arbitrary air mass cut-off choice). It is possible to calculate RMS versus time during a light curve , and therefore infer the systematics component of noise as a function of time, but I haven't done this yet. Whenever I process photometric measurements to produce a light curve I calculate Poisson and thermal noise, estimate scintillation, and compare their orthogonal sum with measured noise, RMS10. (All of these noise levels are entered into an information box of the light curve plot, as illustrated in the next figure.) The difference between the expected noise level and measured noise level can be attributed to either scintillation or systematics. In theory, therefore, there is a way to estimate the level of systematics for a light curve. The first three sources of noisiness are "stochastic" and are expected to have a negligible correlation with spurious variations. The "systematics" source should dominate this correlation. Consider the following LC showing a partitioning of LC noise. Figure 11. Example of LC showing RMS noise components. Individual images exhibited an RMS noise of 7.7 mmag, whereas 6.2 mmag was predicted using calculation of Poisson and thermal noise and a typical level for scintillation. In this example the measured RMS for individual images (RMSi) was slightly larger than the predicted value, which is based on calculated Poisson and thermal components and an adopted typical scintillation component. Since in this case RMSi was dominated by the thermal component, which can be calculated accurately, the total measured noise is insensitive to the assumed level for scintillation. Therefore, we can use the orthogonal difference between RMSi measured and RMSi predicted as an estimate of the level for the systematic noise component. 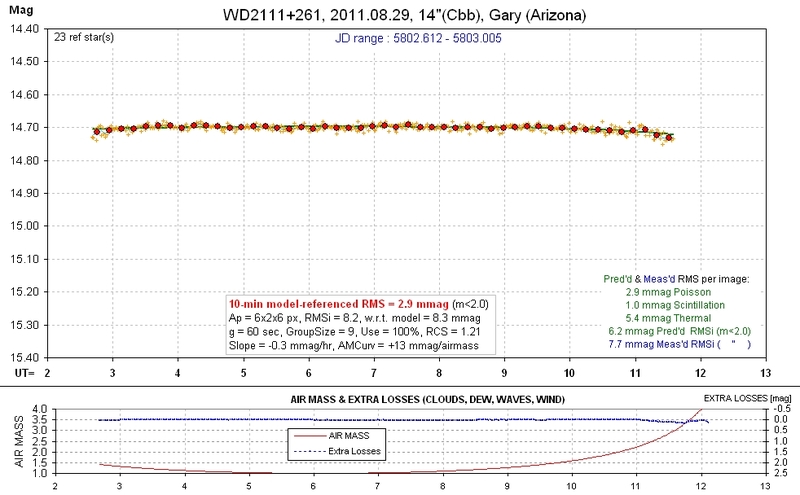 For this example, RMSi systematic = 4.6 mmag. When a sinusoid fit is permitted for this LC a spurious sinusoidal amplitude of 1.3 ± 0.6 mmag is found. 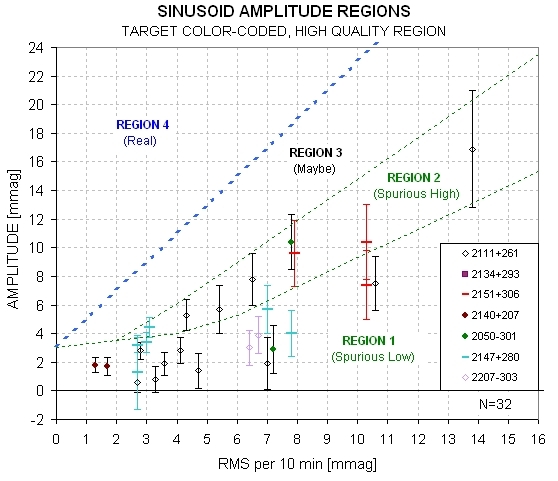 According to the explanation that we're developing here to account for spurious variations there should be a proportionality between the 4.6 mmag "RMSi systematic" and the 1.3 mmag "spurious sinusoidal amplitude." 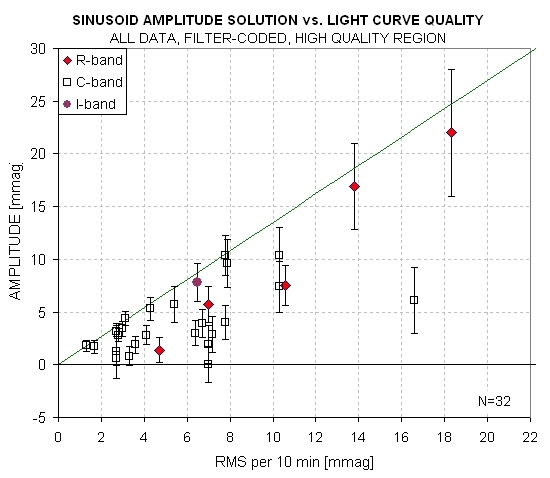 I suspect that if a large number of LCs with the noise information calculated could be analyzed, and if a scatter plot were created relating "spurious sinusoidal amplitude" to "RMSi systematic," there would be a better correlation than exists in Fig. 7 ("spurious sinusoidal amplitude" versus RMS10). A small detail about any future analysis of the type just described is that a better metric for "spurious variation" should be employed than "spurious sinusoidal amplitude" because the latter can be expected to depend on LC length. The longer the LC, the smaller the sinusoidal amplitude (since systematics are unlikely to have a sinusoidal pattern with a constant period). A "spurious variability" parameter should be created for this purpose. A project for the future is to compare "spurious variability" with "RMS systematic" for a large number of properly processed LCs. Proper processing means measuring the noise level on a sampling of images (in areas without stars) throughout the observing session, for determining the "thermal" component of the target star's RMSi, and also calculating the target star's Poisson noise using several reference stars and the correct equation for predicting the target star's Poisson noise. All of this is explained in my book, Exoplanet Observing for Amateurs: Second Edition (link). If there's a positive correlation between "spurious variability" with "RMS systematic" then this would provide support for the speculation in the previous section of this web page, attributing "random walk with an elastic leash" as the cause for "spurious sinusoidal amplitude." And if such a relation exists it might provide a way to more accurately predict an expected "spurious variability," which in turn can be used to more reliably determine the presence of real variability. It's been difficult to get an overlapping pair of LCs to check for similar brightness variation structure, and finally we have a few cases to work with. Figure 12. TG Tan's LC, showing a sinusoidal variation with period 2.6 hours and amplitude 5.8 ± 0.5 mmag. Figure 13. Phase-folded LC for WD2359-434. Consider the following LC, that anyone can see exhibits a sinusoidal variation. Figure 14a. Convincing-looking sinusoidal variation. Now look at a LC taken at essentially the same time a few hundred miiles way. Figure 14b. Convincing-looking non-sinusoidal variation. The curvature is most likely due to the target star being bluer than the reference stars. What can account for these two vastly different LC shapes? I don't know! Here's another case of misleading sinusoidal variations in LCs of the same target on the same date. Figure 15a. A nice-looking sinusoidal variation. Figure 15b. Another nice-looking sinusoidal variation, on same date, though with smaller amplitude. Figure 15c. Overlapping the above two LCs shows a lack of corroboration. 15d. Another example of lack of corroboration of structure. After discovering that one of the V-mag entries in the Villanova Catalog was in error by ~ 2.0 mag's, which caused one observer to waste a night observing a target that was too faint for his telescope, it became necessary to devise an alternate method for deriving a target's V-band magnitude. 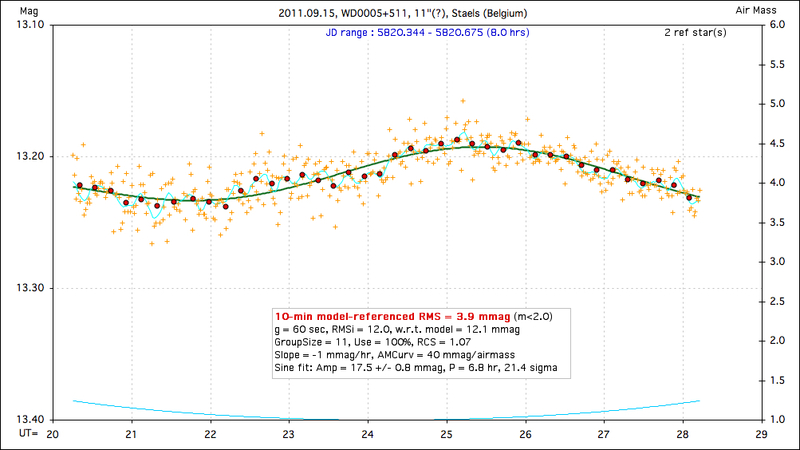 The CMC14 catalog of r'-band magnitudes, combined with 2MASS J and K magnitudes, provide very accurate converted magnitudes most of the time (V-mag SE = 0.020 mag, see http://brucegary.net/dummies/method9.htm). 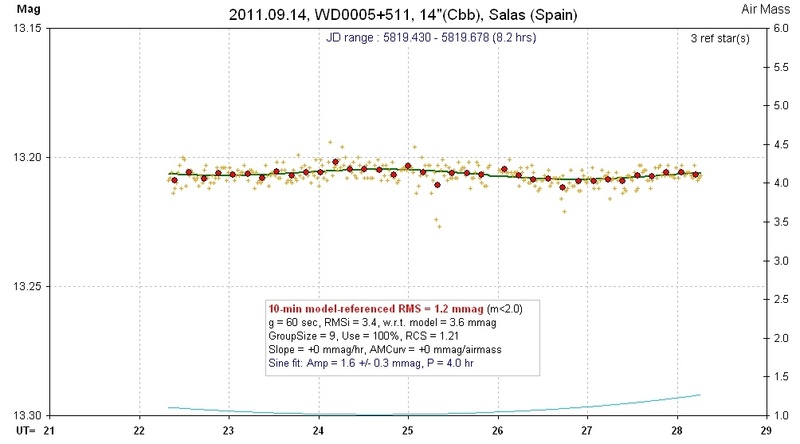 However, the CMC14 catalog has 3 limitations relevant to PAWM: 1) it is limited to a declination range of -30 to +50 degrees, so it could not be used for southern hemisphere targets; 2) converting r'-mag to V-mag produces outliers ~ 6% of the time, and 3) stars fainter than r'-mag ~ 14.5 are insufficiently accurate to justify conversion. A safer, though less accurate procedure, is to perform a conversion using measurements made with a passband closer to V-band and that is useable for fainter stars. The UCAC3 meets this need since their passband is intermediate between V- and R-band and they are useable to ~16.3 mag. Figure 16. 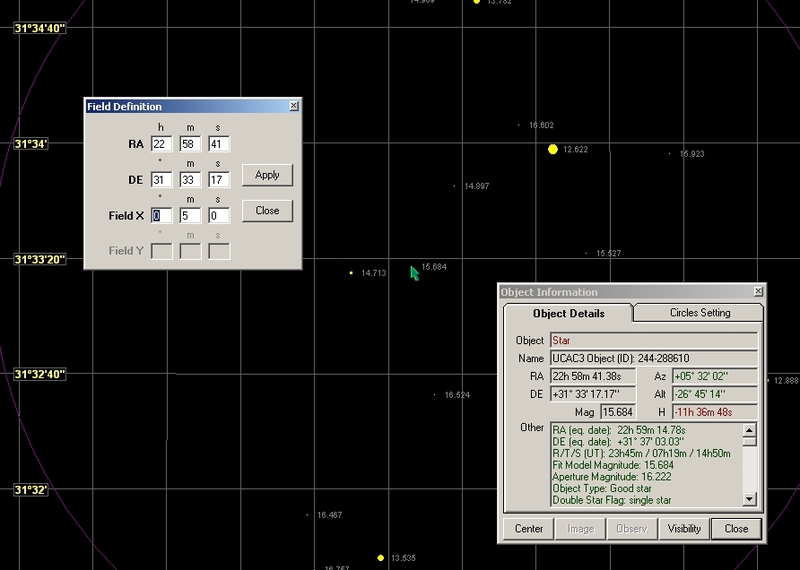 Planetarium program C2A screen capture showing UCAC3's aperture magnitude for a star at 22:58:41 +31:33:17 (WD2256+313). The "Aperture Magnitude" is 16.222. The "Fit Model Magnitude" has been found to be less reliable, so it is ignored. By scrolling down the Object Information window we note that J = 12.305 and K = 11.460. The SuperCOSMOS magnitudes for B, R2 and I are also available, but I have shown that they contribute nothing useful for the task of deriving V-mag. In the next paragraph I describe how I obtained the conversion equation: V-mag = 0.69 + 0.925 × UCAC3a + 0.582 × (J-K), where UCAC3a is UCAC3 "Aperture Magnitude." Using this equation yields V-mag = 16.19 ± 0.08 (where the SE is described in the next paragraph also). I've shown that the outlier rate using this procedure is probably < 1%. For comparison, the Villanova Catalog lists a V-mag of 13.96 (taken from a publication), and this is surely too bright by ~ 2 mag based on actual observations (with a clear filter). Figure 17. 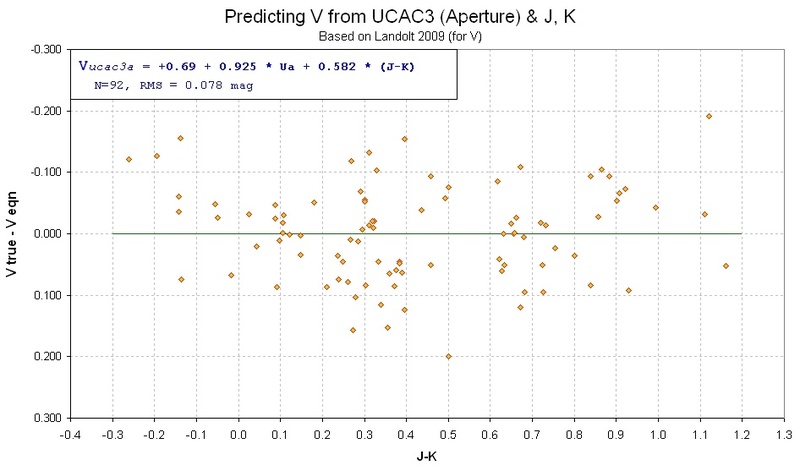 Residuals of my V-mag derivations using UCAC3 "Aperture Magnitude" (referred to as "Ua" in the figure's info box) and J-K star color, versus star color. Manuel Mendez produced this animation to illustrate one scenario of a debris disk orbiting in front of a white dwarf star. It should be considered an "artistic representation" since it is not based on a physical model. Smith, J. Allyn, et al, 2002, AJ, 123, 2121-2144. Landolt, Arlo U., 2009, AJ, 137, 4186-4269.